Micromeritics Instrument Corporation, a global manufacturer of premium products for advanced material characterisation, today announced the acquisition of Freeman Technology. Freeman Technology specialises in providing instruments for the measurement of powder flow properties and other behavioural properties of powders. 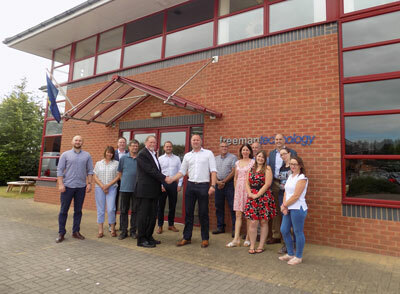 Freeman Technology, located in Tewkesbury, UK, manufactures instruments which deliver data to assist its customers in maximising process and product understanding, accelerating R&D toward formulation and commercialisation as well as supporting the optimisation of powder processes. Micromeritics, a privately held company headquartered in Norcross, GA, is a global provider of high quality scientific instrumentation for material characterisation. In business for over 55 years, Micromeritics offerings include techniques for characterisation of density/volume, surface area and porosity, physical and chemical adsorption, size and shape of particles, porous materials and powders. In addition to designing, building and selling its own instrumentation, Micromeritics, under its Particulate Systems brand, also offers complementary OEM and private label instruments through the Micromeritics global sales channel and distributor partners. Micromeritics also operates fee-for-service testing, certification and methods development laboratories under the Particle Testing Authority and Porotechnology brands in Asia (Shanghai, China); the Americas (Norcross, GA and Kingwood, TX); and Europe (Aachen, Germany). Founded in 1989 as a developer of automated testing systems for material characterisation, Freeman Technology, Ltd. has focused exclusively on powders since the late 1990s. The company’s R&D, manufacturing and commercial headquarters are in Gloucestershire, UK, with operations in China, Germany, Japan and the U.S., and distribution partners in key global territories. In 2007 the company received the Queen’s Award for Enterprise in Innovation and in 2012 the Queen’s Award for Enterprise in International Trade.